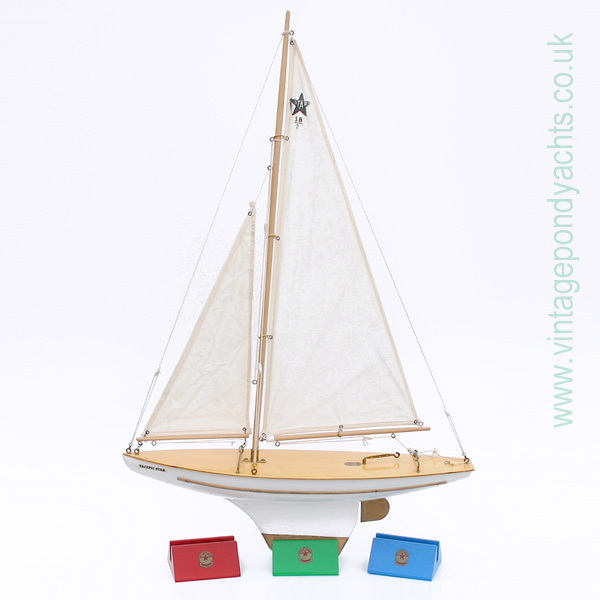 This stand is suitable for the larger, lead keeled models in the iconic Star Yacht range. It is reproduced to the design of the factory product, has an original Star deck transfer applied and is available in authentic Star Yacht colours. Original Star Yacht stands are very rare nowadays, they were always fairly crude in finish and although supplied with the larger, lead keeled yachts they invariably went missing… These, in contrast, are made in hardwood, very highly finished and finally clear lacquered in order to protect the original Star Yacht deck transfer. The above models can be identified from the more common yachts in the Star Yacht range by their thicker, lead weighted keels. It’s worth noting that the factory did release a small number of what were essentially SY/7 models (Ocean Star) but badged as “Arctic Stars”. One can only assume they’d run out of the relevant transfers at the time and these rare models, with flat steel keels, require our medium sized stand. 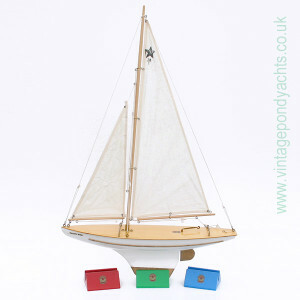 To give an idea of size, the display yacht in the above image (not included) is an SB/2 “Pacific Star”. 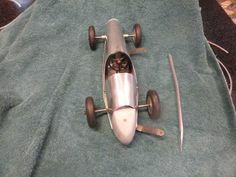 Please note: The stand slot size, into which the yacht keel fits, measures approximately 14.7mm. These stands do not accommodate the very largest – BR/4 “Comet” – SB/4 “Baltic Star” – SB/5 “Western Star” in the Star Yacht range, for these rare models please see our extra large sized stand. 100mm (length) x 85mm (depth) x 45mm (height) approx.